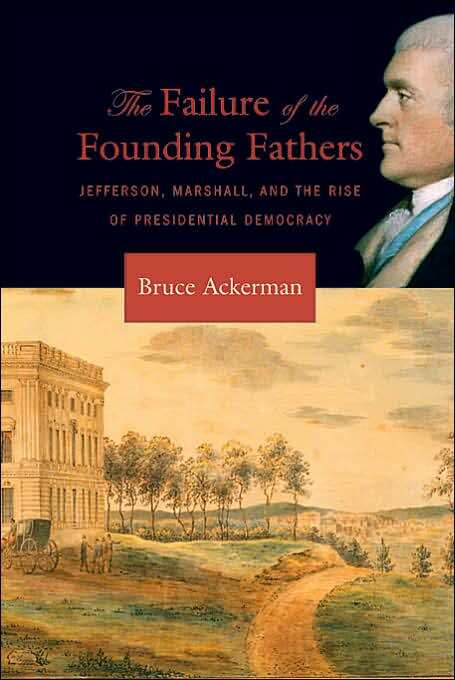 American Early Republic (Early National Period), Authors A-D.
Ackerman, Bruce, THE FAILURE OF THE FOUNDING FATHERS: Jefferson, Marshall, and the Rise of Presidential Democracy. NEW copy, hardcover with dust jacket. (Cambridge: Harvard University Press: 2005). Documents, extensive notes, index, 384 pages. ~~~ From Publishers Weekly: "Focusing on the electoral crisis of 1801, Yale constitutional scholar Ackerman advances a bold new interpretation of early American history. The election is noted for the electoral tie between two Republicans, Thomas Jefferson and Aaron Burr. Jefferson won, of course, but Ackerman's focus is less on the tie than on the sound Republican thrashing of Federalist John Adams. The fracas, he says, revealed a serious flaw in the framework for presidential elections: it couldn't easily accommodate party politics, which the framers had abhorred. The tempestuous jockeying of 1801, the author says, 'marks the birth-agony of the plebiscitarian presidency' -- that is, having soundly defeated the Federalists, a president claimed for the first time that the people had given him a mandate for broad change. 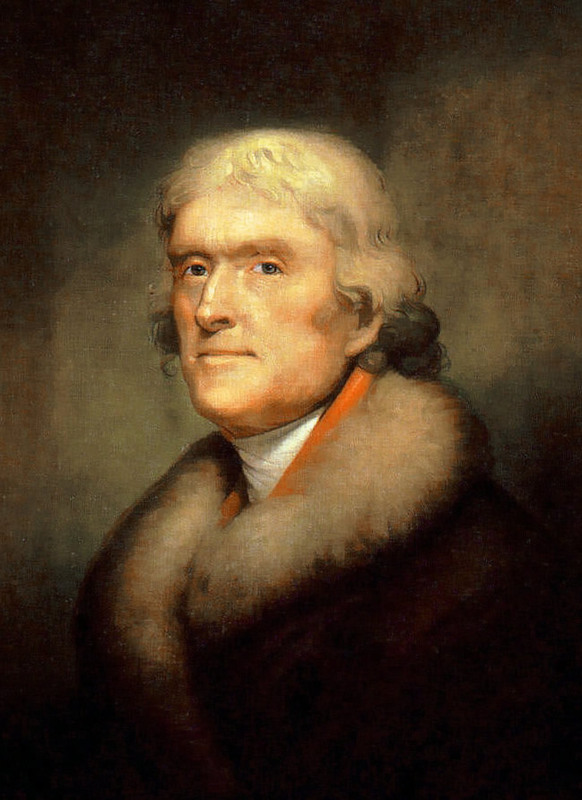 In sketching the consequences of Jefferson's ascendance, Ackerman also rereads the history of the Supreme Court, suggesting that scholars have erred in abstracting the famed Marbury v. Madison decision from the larger political context, i.e., Federalist Chief Justice John Marshall used judicial review to try to limit Jefferson's mandate. Ackerman innovatively recasts the histories of parties, constitutional interpretation and presidential politics. This is not an easy read -- indeed, it's quite dense at times, and the argument is complex -- but the payoff is worth it. Rarely has a study of American history been more timely." 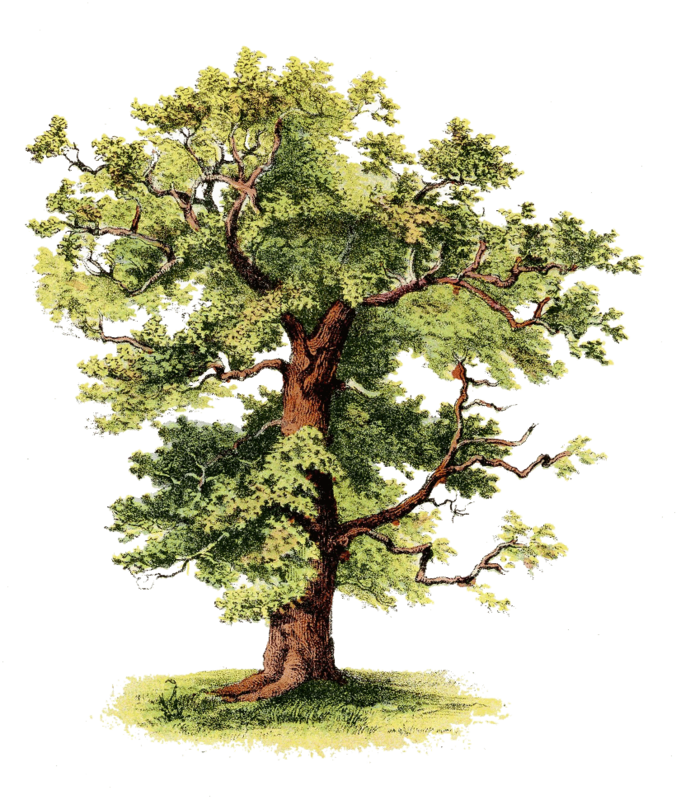 ~~~ From Publishers WeeklyDurrant's (The Beaded Moccasins: The Story of Mary Campbell) well-crafted fictional account of Johnny Appleseed's life reads like an adventure tale. 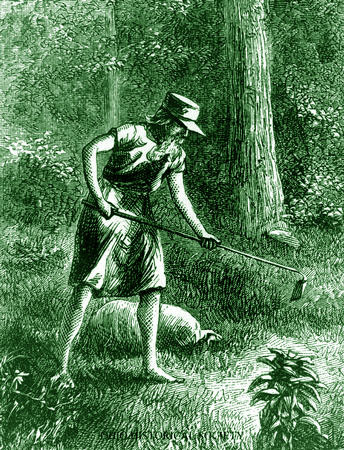 "One for doubt under the hoe, / One to sprout, and one to grow." Johnny's father might have been a drunk ("Nathaniel Chapman's very soul stank of applejack") and an army deserter, but with this homily he plants a seed of inspiration in his son, who lights out for the wilderness to start apple orchards for pioneers. As he crisscrosses the Midwest, "Johnny Appleseed's" fervor about his mission and his ascetic lifestyle (he owns only the clothes upon his back, a saucepan that doubles as a hat and cornmeal, and his seeds and a Bible given to him as gifts) quickly makes him the stuff of legend. "You're all the talk of the Ohio, upstream and down," says a settler near Cincinnati. 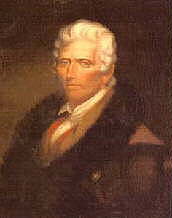 Though his mystical religious beliefs (he considered himself betrothed to a pair of stars he called "spirit-wives") make some folks nervous, they're won over by his sincerity and bravery (during the War of 1812, he ran for three days and nights to warn settlers of impending native attacks). Durrant weaves history and politics into her chronicle of Appleseed's colorful life, along with generous helpings of suspense, including a run-in with bears when Johnny inadvertently tries to share their hollow log. Lively, homespun descriptions ("Whenever he tried to reason it out, his brain would get as muddled as a corn-and-cranberry pudding") and an informative afterword round out the tale. 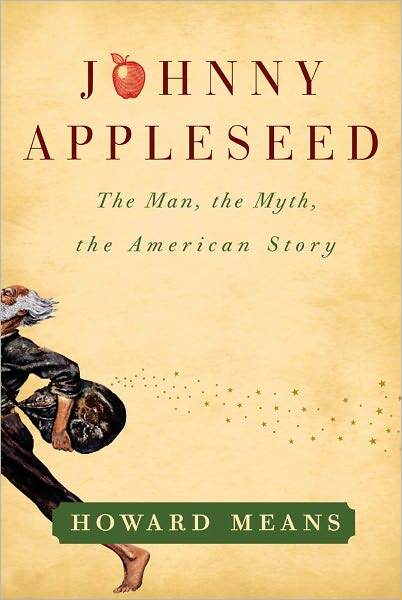 ~~~ From Publishers Weekly: Johnny Appleseed (his real last name was Chapman) is reintroduced in this succinct rendition of the life of a beloved American folk hero, from his birth in Massachusetts in 1774 to his death in Indiana in 1845. Kellogg chronicles Johnny's travels throughout the land, his legendary scattering of appleseeds (originally culled from the orchards he frequented as a child) and his storytelling of Bible and adventure stories to the children and adults he meets along the way, which were embroidered as they were passed along by word-of-mouth). 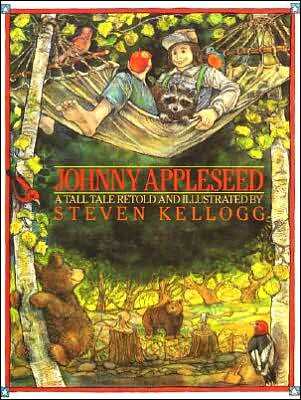 Kellogg's illustrations illuminate a man that all schoolchildren know, in a polished blend of fact and fiction. All ages. Means, Howard, JOHNNY APPLESEED: The Man, the Myth, the American Story. NEW copy, hardcover with dust jacket. (NY: Simon & Schuster, 2011). Illustrations, notes, bibliography, index, 336 pages. 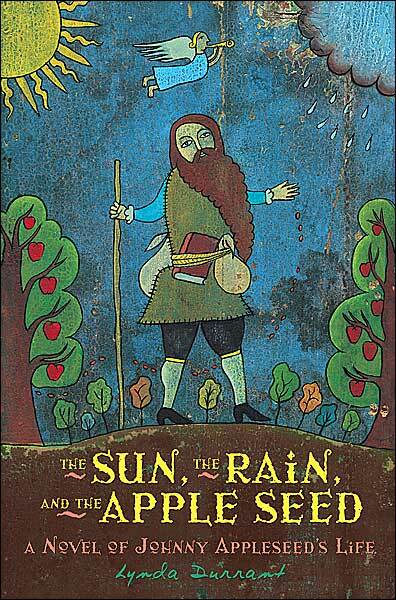 ~~~ This portrait of Johnny Appleseed restores the flesh-and-blood man beneath the many myths. It captures the boldness of an iconic American life and the sadness of his last years, as the frontier marched past him, ever westward. And it shows how death liberated the legend and made of Johnny a barometer of the nation�s feelings about its own heroic past and the supposed Eden it once had been. 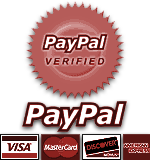 It is a book that does for America�s inner frontier what Stephen Ambrose�s Undaunted Courage did for its western one. No American folk hero�not Davy Crockett, not even Daniel Boone�is better known than Johnny Appleseed, and none has become more trapped in his own legends. The fact is, John Chapman�the historical Johnny Appleseed�might well be the best-known figure from our national past about whom most people know almost nothing real at all. One early historian called Chapman �the oddest character in all our history,� and not without cause. Chapman was an animal whisperer, a vegetarian in a raw country where it was far easier to kill game than grow a crop, a pacifist in a place ruled by gun, knife, and fist. Some settlers considered Chapman a New World saint. Others thought he had been kicked in the head by a horse. And yet he was welcomed almost everywhere, and stories about him floated from cabin to cabin, village to village, just as he did. As eccentric as he was, John Chapman was also very much a man of his times. Arner, Robert D., DOBSON'S ENCYLOPEDIA: THE PUBLISHER, TEXT & PUBLICATION OF AMERICA'S FIRST BRITANNICA, 1789-1803. University of Pennsylvania Press., 1991. NEW, still in shrinkwrap. "The only study of the most prominent American printer, publisher and bookseller betrween the years 1785 and 1822, and his most notable publications, a Hebrew Bible and the first Americanized edition of the Encyclopedia Britannica. The work traces Dobson's important place in the intellectual and cultural history of the early United States and also provides a full picture of the marketing, editing, production and publication of the encyclopedia." 295 pages. 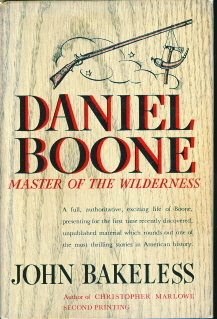 (Boone), John Bakeless, DANIEL BOONE: Master of the Wilderness. VG/VG. Jacket, in mylar, slightly chipped at head of spine. Original price of "3.50" still intact on jacket flap. Second printing before publication. Stated 'First Edition' on rear of title page, and "SECOND PRINTING" on bottom of dust jacket. Book, in beige buckram with dark red lettering & decorations, in very nice, unfaded condition. Pictorial map on endpages. Frontispiece portrait, illustrations, bibliography, notes, index, xii, 480 pp. 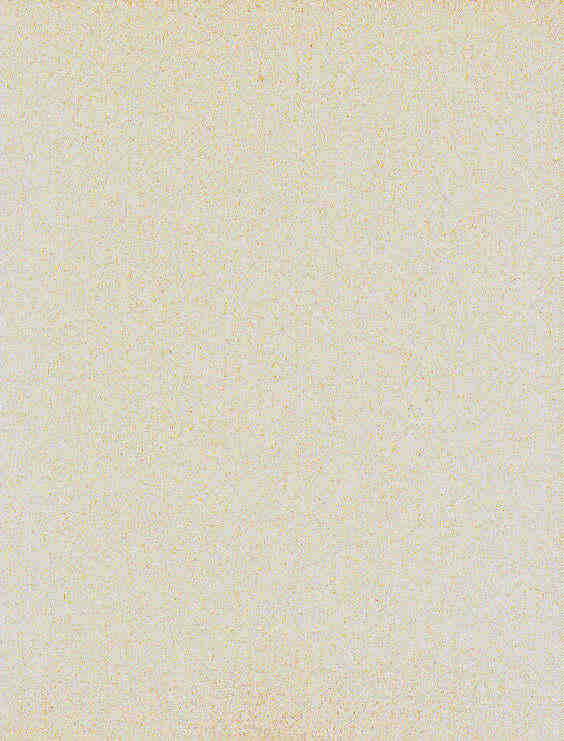 ~~~ Laid-in is a letter on William Morrow & Company letterhead, dated 27 Dec 1939 to a Mr Porter Welch, The Burrows Brothers Co., which reads in part: "...Immediately on receiving your letter of December 20, I searched high and low for two first editions of DANIEL BOONE and I am glad to say, by stooping to theft, I was able to get them for you and to send them along. One of the copies I stole from my own book case and the other I grabbed from Mr. Hobson when his back was turned!" The letter is signed "Polly Street", Director of Sales & Advertising at Wm Morrow & Co.
~~~ "Drawing upon much hitherto unpublished material, John Bakeless here provides the first authentic, detailed account of Boone's escape from his captivity as adopted son of Blackfish, the Shawnee chief; the first accurate story of Boone's departure in search of 'elbow-room', forced out ofthe lands he had charted for others; and the first systematic correlation of British documents with the dramatic events in Kentucky during those years when the frontier hung in the balance between the mother country and the new nation of the Thirteen Fires." (Boone), John Mack Faragher, DANIEL BOONE: The Life and Legend of an American Pioneer. NEW copy. Trade PAPERBACK. SIGNED BY AUTHOR. Maps, photographs, illustrations, Sources of Quoted Materials, Index, 429 pages. ~~~ In the first and most reliable biography of Daniel Boone in more than fifty years, award-winning historian John Mack Faragher portrays America's famous frontier hero. Drawing from popular narrative, the public record, scraps of documentation from Boone's own hand, and a treasure of reminiscence gathered by nineteenth-century antiquarians, Faragher uses the methods of new social history to create a portrait of the man and the times he helped shape. Blending themes from a much vitalized Western and frontier history with the words and ideas of ordinary people, Faragher has produced a book that will stand as the definitive life of Daniel Boone for the next century. 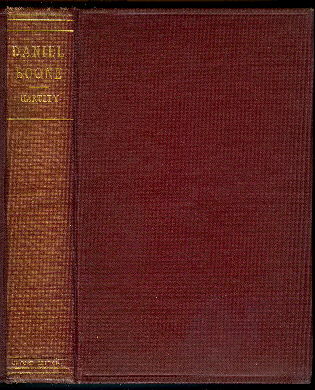 (Boone), Hartley, Cecil B., LIFE OF DANIEL BOONE, THE GREAT WESTERN HUNTER AND PIONEER, Comprising an Account of His Early History; His Daring and Remarkable Career as the First Settler of Kentucky; His thrilling Adventures with the Indians, and His Wonderful Skill, Coolnes and Sagacity under All the Hazardous and Trying Circumstances of Western Border Life; To Which is Added: THE AUTOBIOGRAPHY COMPLETE AS DICTATED BY HIMSELF, AND SHOWING HIS OWN BELIEF THAT HE WAS AN INSTRUMENT ORDAINED TO SETTLE THE WILDERNESS. ~~~ VG-- Interior hinges cracked; book otherwise clean and sound. Maroon boards in very nice condition with virtually no wear; slightly darkened gilt lettering on spine. ~~~ (NY: American Publishers Corporation, no date: circa 1900). REPRINT edition. [Originally published in 1859 by Lovell, Coryell & Co, New York]. Illustrated. 351 pages. Boone's autobiography, appended at the end, originally published in 1784. (Boone), Houston, Peter (edited by Ted Franklin Belue), A SKETCH OF THE LIFE & CHARACTER OF DANIEL BOONE NEW copy. Pictorial blue jacket over blue cloth & tawny paper boards. (Stackpole Books, 1997). Illustrations, maps, photographs, appendices, notes, bibliography, index, 81 pp. "Long ago Peter Houston's A SKETCH OF THE LIFE AND CHARACTER OF DANIEL BOONE should have been properly annotated & published. Ted Franklin Belue has done historians a genuinely useful service in transcribing into a readily available & readable form this insightful contemporary view of Daniel Boone & the times. This is an addition to the Daniel Boone--Frontier America story, casting a new first-hand & contemporary light on the subject." 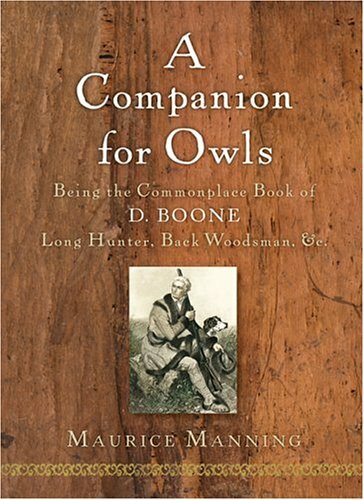 (Boone), Maurice Manning, A COMPANION FOR OWLS: Being the Commonplace Book of D. Boone, Long Hunter, Back Woodsman &c. NEW copy. (Harcourt). POETRY. Hardcover with dust jacket. 128 pages. ~~~ Written in the voice of frontiersman Daniel Boone, A Companion for Owls captures all the beauty and struggle of nascent America. We follow the progression of Daniel Boone's life, a life led in war and in the wilderness, and see the birthing of a new nation. We meet the Cherokee, the Shawnee, and the Delaware peoples. We track the bountiful animals and the great, undisturbed rivers. We stand aside Boone as he buries his brother, then his wife, and finds comfort in his friendship with a slave named Derry. 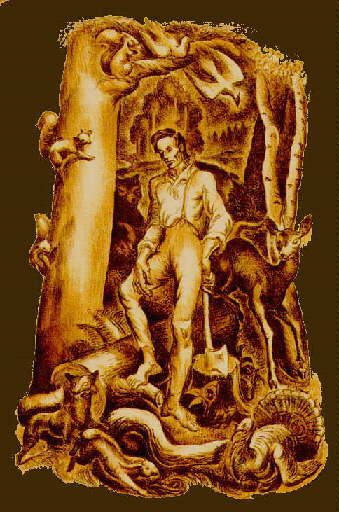 (Boone), John James Van Noppen and Ina Woestemeyer Van Noppen, DANIEL BOONE, BACKWOODSMAN: The Green Woods Were His Portion. VG/VG. Jacket in mylar. (Boone, NC: The Appalachian Press, 1966). Illustrations, maps, bibliography, index, 209 pages. 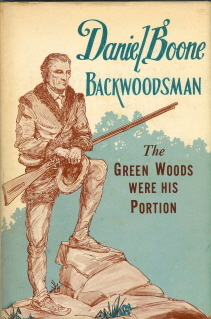 ~~~ From the Authors' Note: "The Green Woods Were His Portion deals chiefly with those members of the Boone Family who constantly moved on to form new counties and new states as long as America had land to be settled, but at the same time it depicts that integral part of American history, the ever-moving frontier. 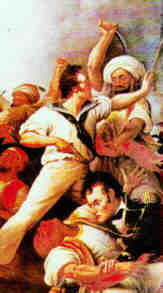 ~~~ For several years we, the authors, have sought in the British Isles the backgrounds of migrants to America during the late seventeenth and eighteenth centuries and their motives for coming. We have asked such questions as these: to what extent were these migrants' characters influenced by their Old World backgrounds? did they achieve their aims in America? These studies were brought into focus by tracing one family with strong family ties -- the Boones, grandparents, parents, son Daniel, and his progeny. In sociological terms this might be considered a case study of the Boones over a period of 170 years." (Boone), Gary J. Sweeney, THE COLUMBUS OF THE WOODS: Daniel Boone and the Typology of Manifest Destiny. An Exhibition Commemorating the Columbian Quincentenary. Fine, as new. Wraps. 8.5x11. (Washington University Gallery of Art, 1992). 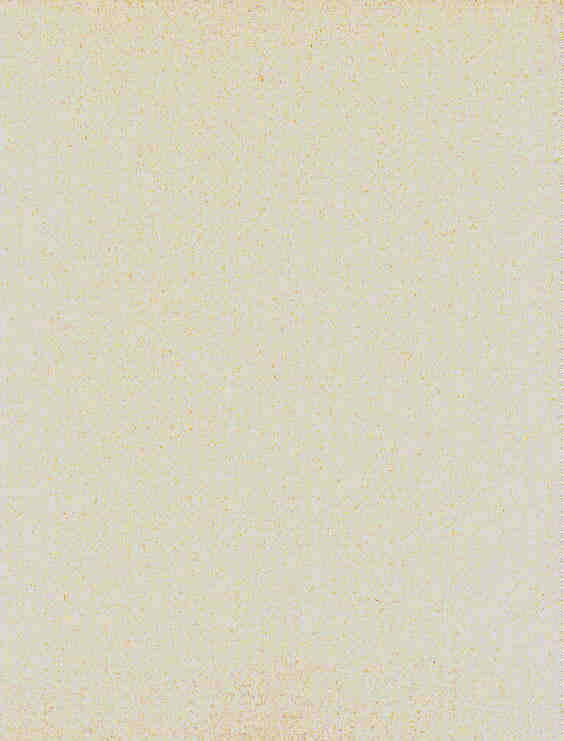 Profusely illustrated, drawings, etchings, paintings, color plates, endnotes, bibliography, checklist of the exhibition, 83 pp. 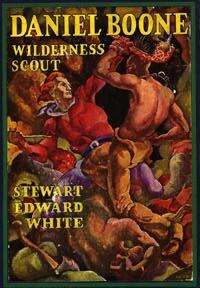 (Boone), Steward Edward White, DANIEL BOONE: Wilderness Scout. The Life Story and True Adventures of the Great Hunter Long Knife Who First Blazed the Wilderness Trail Through the Indian's Country to Kentucky. VG/VG. Minor tears to head & heel of jacket spine, which is in a mylar protector. (NY: Garden City Publishing Company, 1922). Illustrated by James Daugherty. 308 pages. 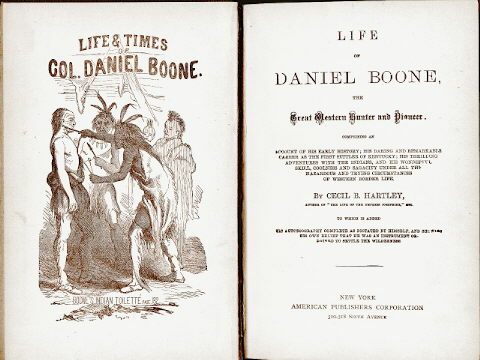 ~~~ Written by author for the Boy Scouts of America: "If the Boy Scouts would know a man who in his attitude toward the life to which he was called most nearly embodied the precepts of their laws let them look on Daniel Boone. Gentle, kindly, modest, peace-loving, absolutely fearless, a master of Indian warfare, a mighty hunter, strong as a bear and active as a panther, his life was lived in daily danger, almost perpetual hardship and exposure; yet he died in his bed at nearly ninety years of age." Brigham, David R., PUBLIC CULTURE IN THE EARLY REPUBLIC: Peale's Museum and its Audience. NEW copy. Hardcover with dust jacket. (Smithsonian Institution Press, 1995). 40 illustrations distributed throughout text, notes, appendices, bibliography, index, 218 pages. 8" x 10". 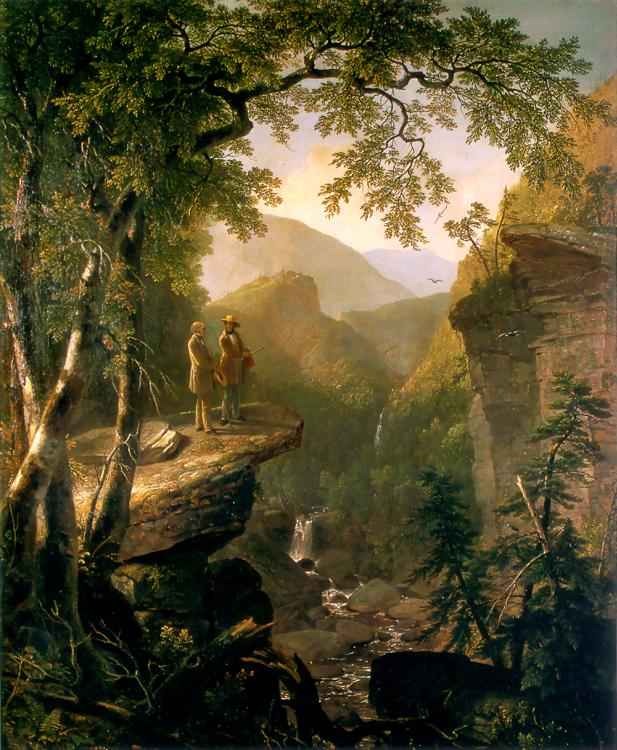 ~~~ When Charles Willson Peale redesigned his personal painting gallery in 1786 to include a �repository for Natural Curiosities,� one of America�s first museums of art & science was born. Tracing the development of Peale�s Philadelphia Museum as an educational institution, as a business, & as a form of entertainment, Brigham shows how this �world in miniature� helped define the terms of participation in early national cultural institutions. Examines the museum�s place in early American cultural life from the perspective of patrons & donors & by analyzing Peale�s promotional efforts toward specific segments of the population, and its goal of establishing a universally educated public. ~~~ "His examination of both its projected and historical audience makes an important and exciting critical move." (Chandos Michael Brown, College of William & Mary). Cole, Donald B. & John J. McDonough (eds). WITNESS TO THE YOUNG REPUBLIC: A YANKEE'S JOURNAL, 1828-1870: BENJAMIN BROWN FRENCH. University Press of New England, 1990. NEW copy. First Edition. Maps, genealogies, appendix, notes, index, 675 pages. Previously accessible only in the original 11-volume journal at the Library of Congress, French's diary is a splendid example of a 19th-century ``insider's account.'' Witnessing events in the nation's capital from 1833 to 1870, French was acquainted personally with every president from John Quincy Adams to Ulysses Grant. As a diarist, French is superb; his writing style is not only clear and lucid but, with a flair for the dramatic and the gossipy, entertaining as well. Personal accounts abound of Jackson, Webster, and Douglas, and French, who observed Lincoln on a regular basis, was present at the Gettysburg Address and in the room as Lincoln lay dying; afterwards, he was in charge of the President's funeral arrangements. The editors have culled about a third of the original 4000 pages, selecting those passages that best depict the personalities, manners, and events of French's time. An interesting account of the great men and events of an important period (Library Journal). Currently in print at $60.